MANHATTAN — The hot market has made some sellers too bold while many buyers aren't playing their cards right, according to the city's brokers. Buying and selling real estate is always an emotional rollercoaster, but there are certain mistakes people are making that are particular to the current frenzy — whether it's sellers being unrealistic about prices or buyers being unrealistic about their odds, brokers told DNAinfo New York. 1. Don't price too high. Hearing about record-breaking penthouse prices at ultra-high end buildings such as Midtown's One57 has given some condo sellers and developers "delusions of grandeur," Richard Steinberg, of Warburg Realty, said. When a new boutique condo at 230 East 63rd St. came on the market in October, its developer priced the six units of the pre-war building — renovated with modern touches such as oak floors with radiant heating — 15 percent higher than Steinberg, its sales agent, recommended. "The minute I let it out that we were slightly negotiable, I sold four out of six units in two weeks," he said of the recent sales. "If you're priced appropriately, in the first 30 days you'll get an offer." The building's three-bedroom 2,200 square foot maisonette, for instance, was listed at $3.983 million and is now asking $3.75 million. Pricing too high is also a common mistake with "For Sale By Owner" listings, said Kelly Waters, of Miron Properties. "[Then] the properties sit on the market too long causing them to become stale, and they get very little traffic through the door." 2. Don't price too low. Some brokers are underpricing apartments to attract crowds to open houses so that lines look like those outside a popular night club, said Douglas Elliman's Brian Meier. The goal is to create a bidding war with a sense of urgency, but the tactic could backfire if the apartment is priced too low and the sellers expect big gains, said Meier. But the tactic could work on a "rare property" such as 272 Water St., a one-bedroom duplex loft in a former wine warehouse with a huge terrace that was listed for $2 million. It had three offers within three days and went for 4.5 percent more than the asking price, Meier said. 3. Don't hold out too long. The best offers always come early, Meier and other brokers said. Meier has seen some "excellent offers from excellent brokers" take weeks to be accepted as "entitled and emboldened sellers" hold out for higher bids. Waiting, however, might result in a price drop because the shelf life of a property on the market for one week is very different from one that's been sitting around for two months. After a $1.2 million Fort Greene home on St. Felix Street was a featured property on the popular Brownstoner blog, the sellers thought they could wait for a better offer, Meier said of his clients. Though he advised otherwise, they held out, and in the end, they sold for $1.25 million. This was $95,000 less than an earlier offer. 1. Don't go in blindly without a broker. Some house hunters think they can get a leg up with a seller's broker if they have no buyer's broker, since the seller's broker could then get the full commission rather than splitting it. But the seller's broker has the seller's best interest at heart, not the buyer's, agents emphasized. Douglas Elliman's Clayton Orrigo had a client — initially working on his own — lose a deal because he was relying on the advice of a broker "representing the seller." "The process is complex. You need a trusted adviser," Orrigo said. Joan Kagan of Keller Williams NYC added, "A knowledgeable and experienced real estate agent knows how to submit an offer that makes the buyer look most appealing to a co-op board, which is important to a seller." 2. Don't bid too low. You won't get a great deal in this market by submitting a low offer, brokers said. 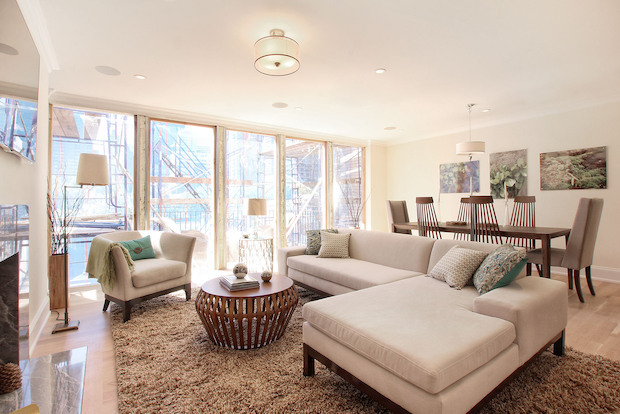 "In this market, getting an apartment that you like is getting a great deal," Kagan said. "If a buyer comes in with a low initial offer the seller, at best, does not think that the buyer is serious. At worst, the seller is insulted and does not wish to negotiate with the lowballer." Rather than concentrating on getting a deal, take the time "to understand what something is worth," Robert Dankner, of Prime Manhattan Residential, advised. 3. There is always someone else who wants what you want. "With a market this quick, you always have to assume there's one more person who thinks like you either right behind you, waiting for you to stumble," Dankner said. For example, the day his clients finally decided to swoop after circling a Greenwich Village house, two other offers came in. "My buyers were having a hard time believing this," Dankner said. "But there is always at least one other person who is just like you."